There has been much attention raised in recent years over the digital economy and its impact on economic growth and businesses in the modern day. While there has been some understanding on what the digital economy entails, there is a lack of consensus on the generally-agreed definition or practical concepts of the technologies that comprise it. Providing another descriptor of the digital economy, it refers to a globally-networked system of economic activities, commercial transactions and digitally-enhanced interactions that are enabled and empowered by information and communication technologies (ICTs). Some of these technologies, which are ever-increasing in popularity in today’s commercial world, include cloud computing, big data, machine learning, robotic process automation and artificial intelligence (AI) as they have become integral to how we live, work and play. The proliferation of ICTs has enabled our workforce and economies to be more flexible, agile and smart. These technologies can help drive innovation, unlock business and employment opportunities, and create greater efficiencies. We already see some of these benefits at play in Southeast Asia, with the digital economy projected to contribute an additional US$1 trillion to the region’s GDP by 2025, according to a 2018 report by Bain & Company. To exemplify this growth, the e-commerce/online shopping market in Southeast Asia’s six biggest economies is projected to reach US$64.8 billion in 2021, almost doubling the US$37.7 billion in 2017. However, it is also important to consider that the transformative nature of technology comes with potential risks and challenges in adoption. Technology is both a great enabler and disruptor and can have complex, far-reaching and disruptive consequences for businesses and workplaces alike. This process of change, often referred to as digital transformation, must be carefully considered in order to maximise opportunities while managing change. One aspect that can be addressed with digital transformation is the perceived detrimental effect on the workforce and the future of work. History (and economic theory) has demonstrably shown that while there are definitely noticeable periods of instability brought about by technological disruption, ultimately, our economies and workforce still stand to benefit both cyclically and long term. The advent of the Internet and new digital communication protocols such as e-mail revolutionised how businesses work globally and led to a boon in e-commerce and digital platforms. Recent estimates of Asian economies by the Asian Development Bank found that the adoption of robots and AI stimulated higher productivity and economic growth, creating an estimated 134 million new jobs, significantly exceeding the 101 million jobs at risk to reorganisation. In the context of job growth and bettering our work lives, technology is to be embraced. Ultimately, what makes the future of work murky can be attributed to its timing and impact. The threat of redundancy and/or reskilling that accompanies the adoption of digital technologies is a lot more evident and occurs much faster than the emergence of new work opportunities, with the latter often requiring significant investments in training or structural change. These changes also tend to have a disproportionate impact across employee classes, with lower-skilled, blue-collar workers bearing the brunt of disruption. According to a 2017 study by the McKinsey Global Institute, almost 60% of all jobs today can be further automated. In the face of such stark projections, it can be easy to assume that with the increasing prevalence of digitalisation, our labour-intensive workforce is greatly at risk. However, the very same research also highlights that the proportion of work that will actually be displaced by 2030 is likely to be low (an average of 15% globally). Nonetheless, it is still crucial for our workforce to constantly reskill and retrain themselves to prepare for the digital future. These new jobs created by digital technologies will undoubtedly require different skill sets. These may be technical in nature, such as web design or fluency in a programming language, but just as important are soft skills, such as information processing, creativity, problem-solving, people skills and communication. How we work with one another also matters, and there is a shift away from the traditional workplace models of independent silos or production lines, towards a more globalised and interconnected workplace. Of all the various facets of an organisation, the impact of digital transformation in finance is perhaps the most profound. Many organisations are still in the early stages of applying digital technologies to finance processes, in ways that will create more efficiencies, insights, and value over the long term. Chief Financial Officers (CFOs) and their teams play a crucial role in this digital transformation process as they act as gatekeepers for critical financial and operational information across an entire organisation, which is required for essential forecasting and supporting senior leaders’ strategic plans. These may include data relating to sales, operations and supply chains, as well as real-time industry and market statistics. In a digital economy, the traditional metrics of financial controllership and compliance are no longer the defining qualities of effective financial leaders. According to a 2018 study by the Aspen Institute, the most critical skills for CFOs to succeed today are general management and creative strategy. Long recognised for their role in measuring and implementing quantitative elements of performance and efficiency, CFOs today will also be required to devise top-to-bottom strategies and be agents of change for digital transformation across their organisations, using their innate financial knowledge and analytical expertise. Advancing digitalisation of the finance function is an important objective for organisations, as business data becomes more readily available and manageable with more innovative connectivity tools. Another study by McKinsey in 2018 emphasised certain areas of digital technology that will become especially prevalent in the finance function – automation and robotics to improve processes in finance, data visualisation to give end-users access to real-time financial information and improve organisational performance, advanced analytics for finance to accelerate decision-making and advanced analytics for business operations to uncover hidden growth opportunities. Workday, a company which provides enterprise cloud applications for finance and human resources, recently commissioned a global survey of more than 670 senior financial leaders to understand the challenges and opportunities faced by finance leaders in the digital economy. The findings unveiled jarring perceptions in the upper echelons of corporate finance and highlighted stark challenges that could hinder efforts to digitally transform finance. 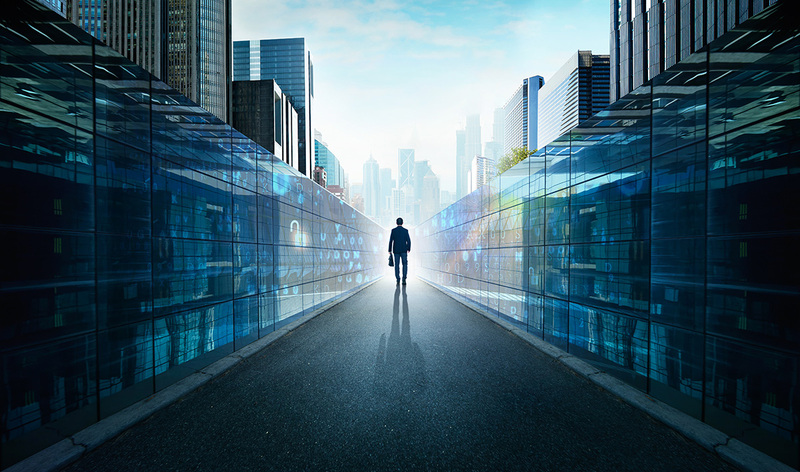 For many finance practitioners today, there is often a rift between expectations and reality in digital transcendence, with many barriers to adoption in place. These barriers can exist due to a myriad of issues, such as differences in culture, familiarity, technological aptitude and organisational adaptability. In today’s volatile and uncertain business world, the ability to manage risks on behalf of the organisation is critical for CFOs. Yet, respondents reflected that there was a lack of meaningful data that could be used to build data models and predictive capabilities to support risk management. This was attributed to data being trapped in legacy systems and organisational silos where different functions within an organisation do not share information and knowledge with one another. Similarly, even though there is awareness among CFOs for the potential that advanced data analytics has in providing useful insights to drive growth and strategy, only around one-third surveyed actually said they use those technologies actively in finance tasks such as risk management and financial reporting. Finance leaders surveyed also do not foresee the extensive use of advanced analytics in the finance functions to increase significantly in three years’ time, with only minor increments in adoption projected. The difficulty in integrating financial and non-financial data is also an issue with adoption, due to the looser structured and often qualitative nature of non-financial data, which can require a significant amount of effort and time in processing for analysis. Workday’s survey also discovered that many finance teams still work with disparate systems and spend a disproportionate amount of their time aggregating and reconciling data instead of using that time for analysis. The survey also revealed a significant divide between next-generation finance executives (those below the age of 40, and who have considerable business experience outside of finance) and traditionalists (who are above the age of 50, and who have spent the majority of their careers in the finance function) in the way they view data and analytics. Next-generation finance executives generally reflected greater awareness of the impact of new technologies than their traditionalist peers, with more than half (52%) of the next-generation identifying the pace of technological change as a key risk, compared to 35% among traditionalists. This lack of consensus is exacerbated in another area – the lack of effective collaboration between the CFO with other key C-suite peers (such as Chief Information Officers). As digital transformation often encompasses multiple parts of the organisation rather than in a controlled and isolated manner, a strong relationship between the senior management team is critical in driving change. However, more than two-thirds of finance leaders surveyed said that they found it hard to collaborate effectively with their peers, primarily due to the use of different terminology, perspectives on work or simply the reluctance to work with one another. Lastly, finding the right people with the right skills was a key concern, as organisations across different industries are vying for finance executives with the relevant digital skills and experience. Up to 71% of the finance leaders surveyed said they face tough challenges recruiting the right talent due to the limited pool of talent available. This is a big issue across various industries with retail, insurance and hospitality being among the most labour-competitive. There is still a significant amount of work to be done in order for today’s finance leaders to successfully herald in the digital future. For any organisation to redefine its finance functions and maximise the benefits to be reaped from the digital economy, it has to ultimately focus on certain crucial aspects of the business; some of these aspects include build resilience, deliver strong leadership and foster talent. Building business resilience requires organisations to invest in systems and data management approaches that can allow them to identify the right financial data, ensure the quality of the data and make it easily accessible to key business leaders within the team for informed decision-making. CFOs should take the lead in equipping employees in the organisation with the skills required to analyse data and build risk analysis models, as well as drive a culture that prioritises a quantitative and data-driven approach to financial analysis. Strong leadership within an organisation is equally crucial. CFOs will be required to work closely with their C-suite peers to transform and unlock systems, where they have traditionally been confined to their various departments. CFOs will also need to put in place structures and processes to facilitate better communication and understanding through a top-down approach. Finally, through staying abreast of changes in the workplace as well as fostering dialogue with human capital leaders, CFOs will be better able to forecast what organisational talent will be needed for the future. An effective partnership in this regard will ensure that finance teams are suitably future-proofed and prepared in the ongoing war for talent. Tim Wakeford is Vice President of Financials Product Strategy, Workday.